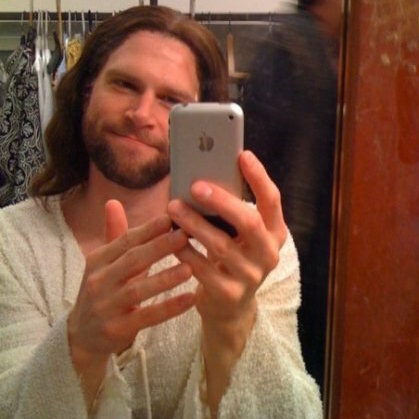 So before I go any further let me just say I tried to think of how this photo could be a cool connection to what I am going to talk about because who doesn’t want a picture of Jesus taking a selfie amiright?!? But alas, no connection sorry guys ha. Last night we talked about two things. We talked about what community means and meant in the lives of two students, Bruno(Justin) and Autumn, this weekend. Bruno accepted Christ (praise the Lord!) this weekend and has been so encouraged by his new community. He said that for him community was that we all should stick together as a body of believers. That we should be able to call on our nearest brother and sister in Christ. Together we can reach out and touch others, much like was done to him. Like Adam said this weekend, we cannot hope to build our faith and our relationship secluded on an island or trapped in a deer stand. Our faith is meant to be lived within a body of believers, sharing love and joy, heartbreaks and loss. Autumn came in from the other side, she had little expectations for DNCW15 other than to hang out with friends. But while she was there she felt God telling her that she needed to do something. From that point she has had no choice but to share God’s love in situations she couldn’t see before. Whether that be in school or even getting to share on front of the entire youth group, God has provided her with that wisdom to see situations for Him to be known. I love stories like these and what they mean for our youth group. I hope we further our goals to continue community as we reach out with our brothers and sister in Christ this week and even this year. Just as my not so clever title suggests, God and the Bible are one and the same. It was with Him in the beginning and it will be with Him forever. We literally have access to a book that is with God! Do you understand how incredible this is? The God who made all things, including you and me… He’s right there, sitting right in front of you. By your side on Sunday morning. On your nightstand every night. God is with us, completely, and in so many other ways. There you go. I can stop writing now. Do you see how powerful and simple this statement is. God is here with us. He is in the darkness. He lived in the darkness with Jesus. Then He conquered it, and the darkness cannot overcome it. That’s what we have. We are on the winning side. Next time you pick up your Bible remember that. It is a direct line to God. Nothing can separate us from the love and ultimate authority of God. That’s encouraging, and we have literally only scratched the surface. I think it’s cool to see how God uses events and our Christian community to work through people’s lives. This is from right after DNCW15 when we were still just beginning John. Let’s pray this week that God will use Car Bash to bring new members into our community.